As a frequent traveler and a coeliac I am often asked for gluten free hotel recommendations. 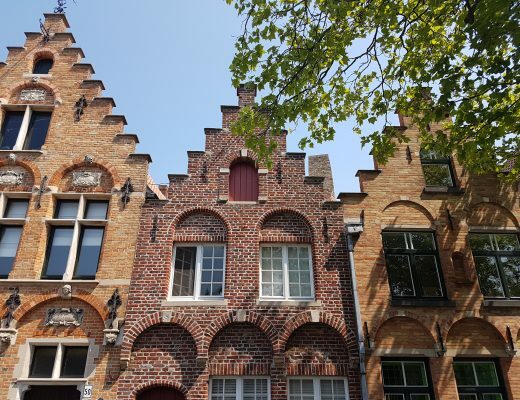 Finding a hotel that is both a luxurious place to stay and somewhere able to cater for gluten free dietary requirements can feel like hitting the jackpot and it turns a good holiday into a great one. 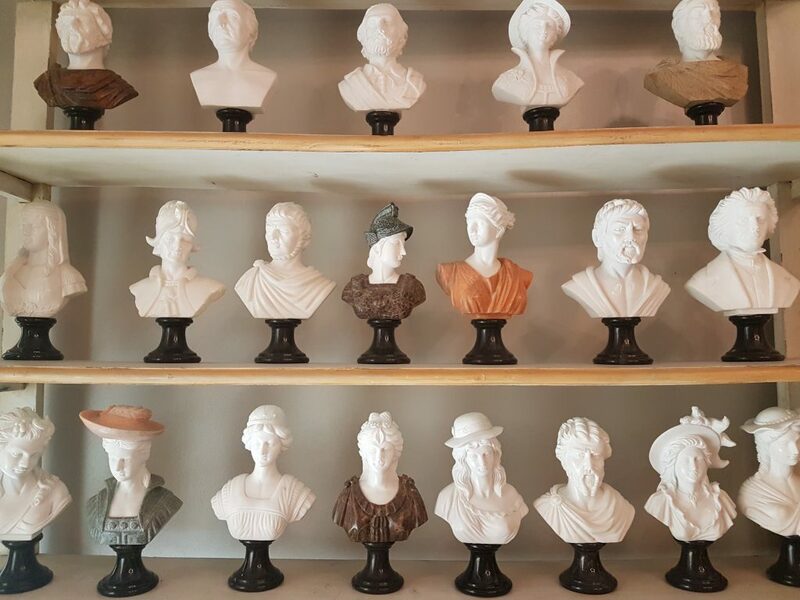 We visited Florence early this year on a family trip and wanted to stay in the heart of the city. We had done some long travel days and wanted to give our daughter Alba a break from her car seat. 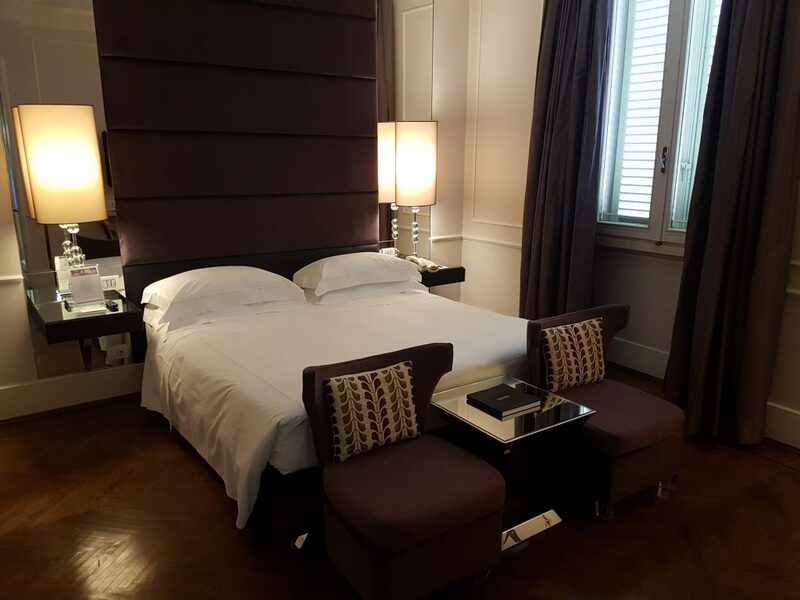 After trawling through Google and Tripadvisor we discovered the wonderful Hotel Brunelleschi. 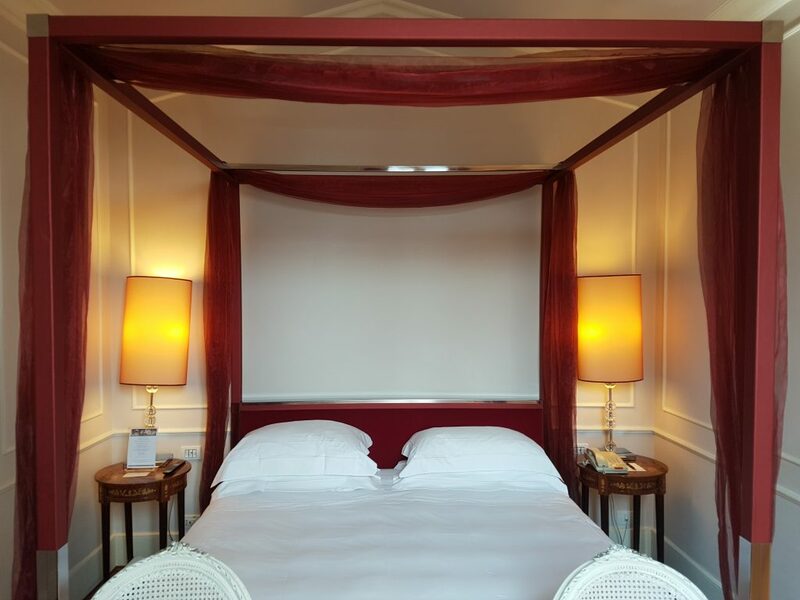 Centred around the famous Torre Pagliazza, the oldest building still standing in the historical centre of Florence, Hotel Brunelleschi is a stunning place to stay. So much so that this elegant, historic 4-star hotel was featured in the famous Dan Brown novel the DaVinci Code. 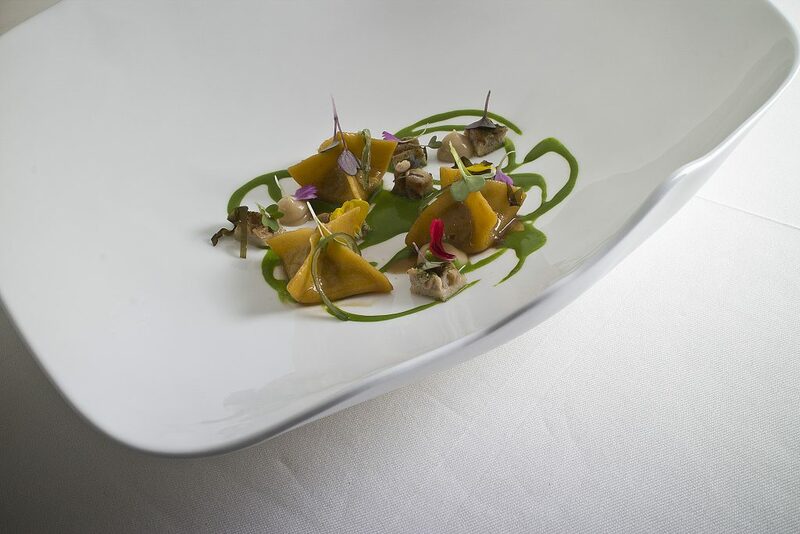 The hotel is ranked among Florence’s top hotels and is equally well-renowned for its food. Their coeliac credentials were the thing that caught my eye when I was hotel hunting and the hotel kindly hosted us for a night to allow me to discover their gluten free offering for myself. 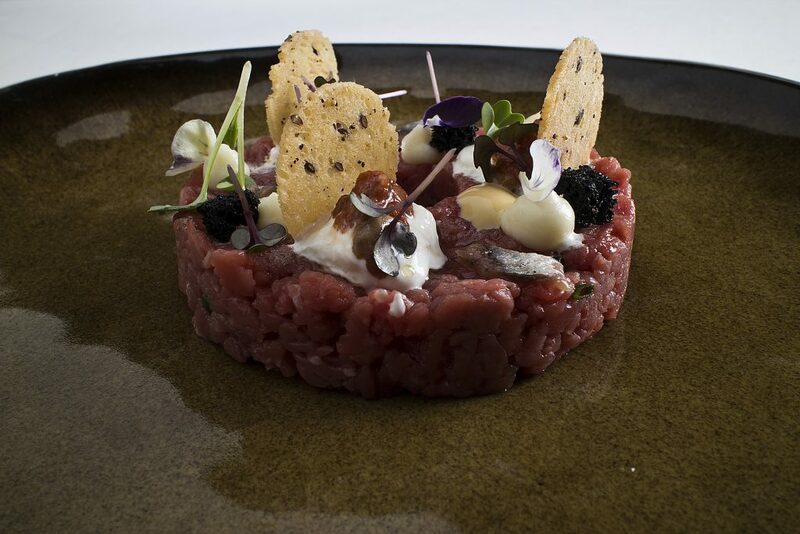 Read on, my friends, and allow me to take you on a little culinary tour of Hotel Brunelleschi. 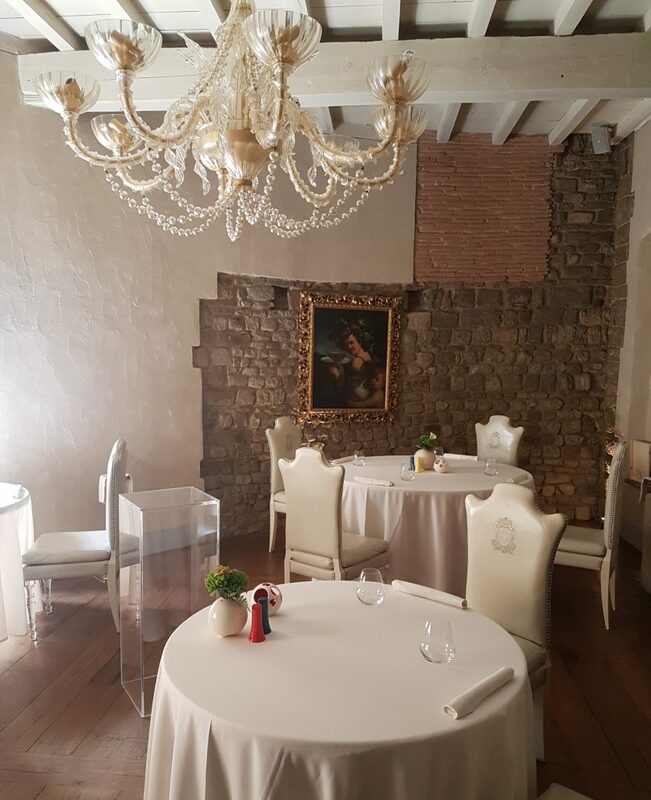 A luxury restaurant inside the hotel’s historic tower, Santa Elisabetta is one of Florence’s top restaurants and is mentioned in the Michelin guide. 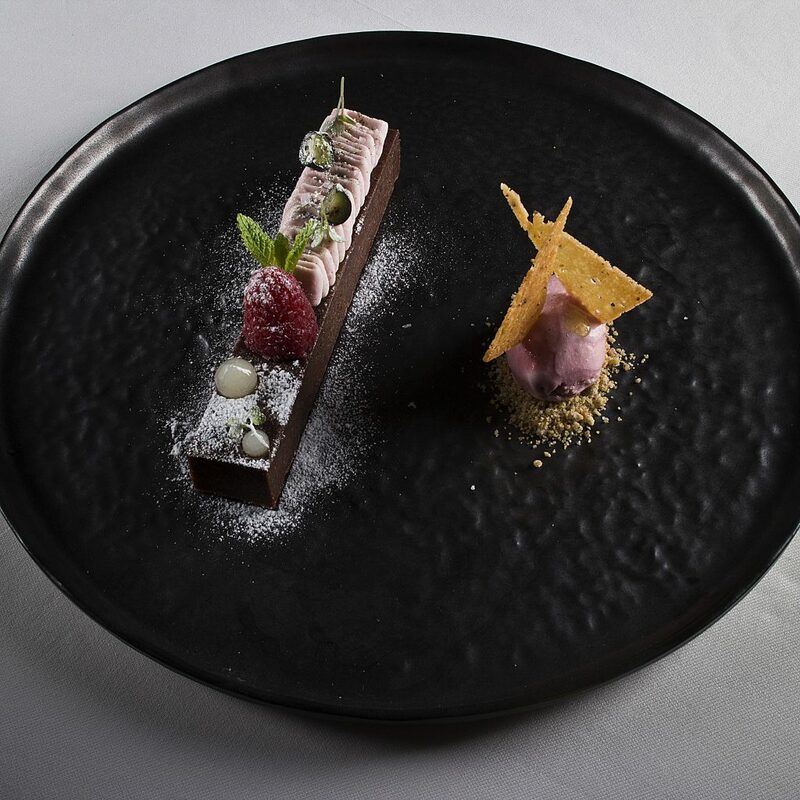 With a focus on Tuscan food, Santa Elisabetta caters fully for gluten free and coeliac diners with their exquisite 5, 7 or 9 course tasting menu. 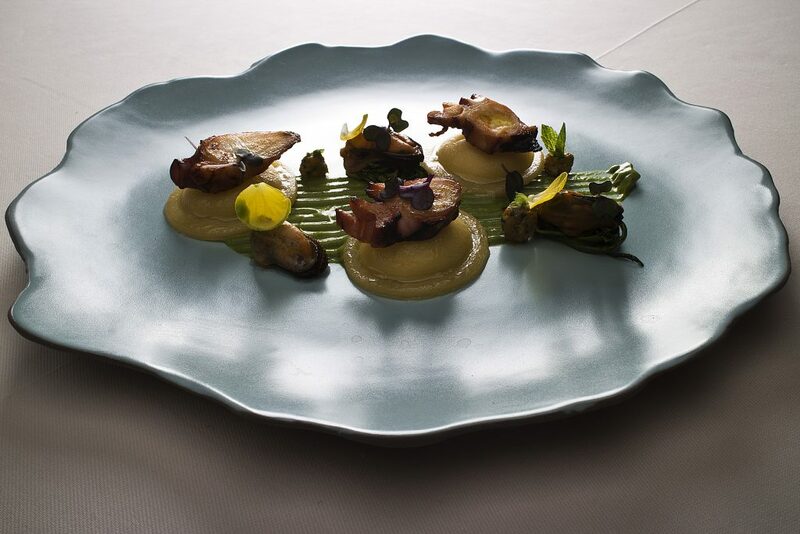 The restaurant is very small and exclusive, making it the perfect location for a romantic dinner in Florence. Santa Elisabetta can also cater for vegan and other dietary requirements. 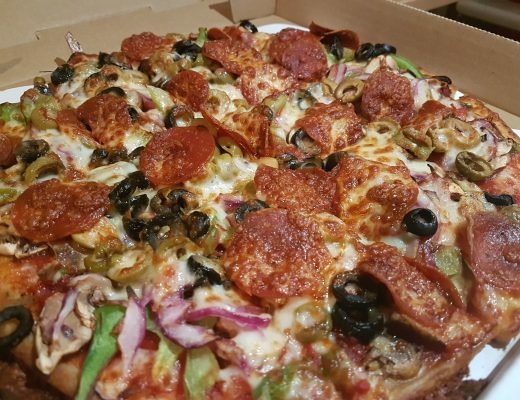 Here are some photos of their incredible food to get your mouth watering. You must book in advance due to its popularity and the restaurant is closed on Sunday and Mondays. Please mention that you are coeliac when you book as the kitchen can then prepare the best possible menu for you. 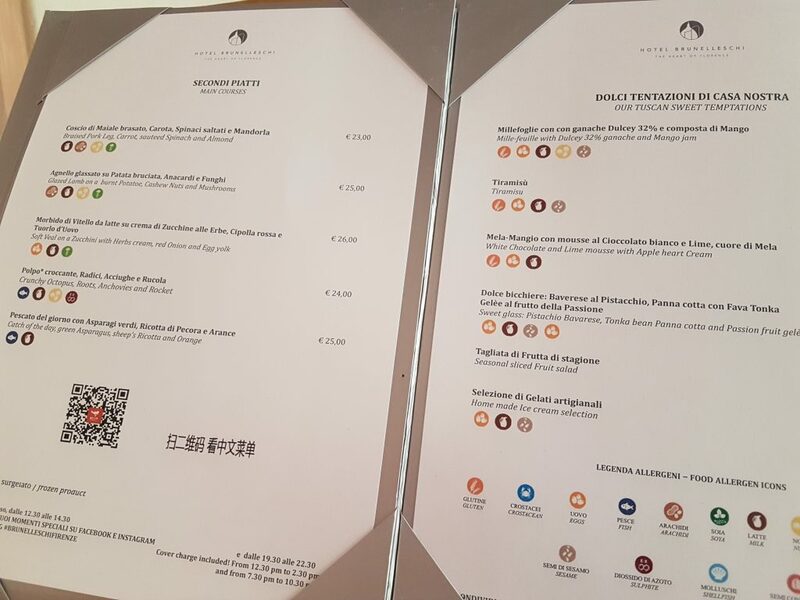 Perfect for a quick lunch, dinner or drink, the Tower Lounge Bar and the Osteria della Pagliazza are located on the ground floor of Hotel Brunelleschi. 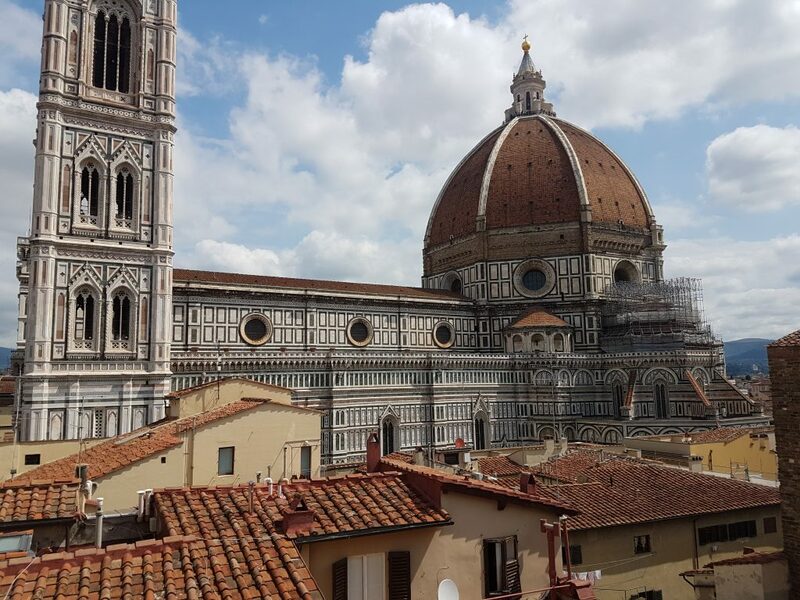 The latter includes a lovely outdoor terrace that is set in a small peaceful piazza, yet is a mere stone’s throw away from the beautiful Duomo and the hustle and bustle of other Florentine sights. The restaurant menu is clearly marked up to show the allergens in each dish, making it easy for gluten free dinners to choose a safe meal. Equally, staff are well versed on all things gluten free and can assist with any coeliac questions you might have. 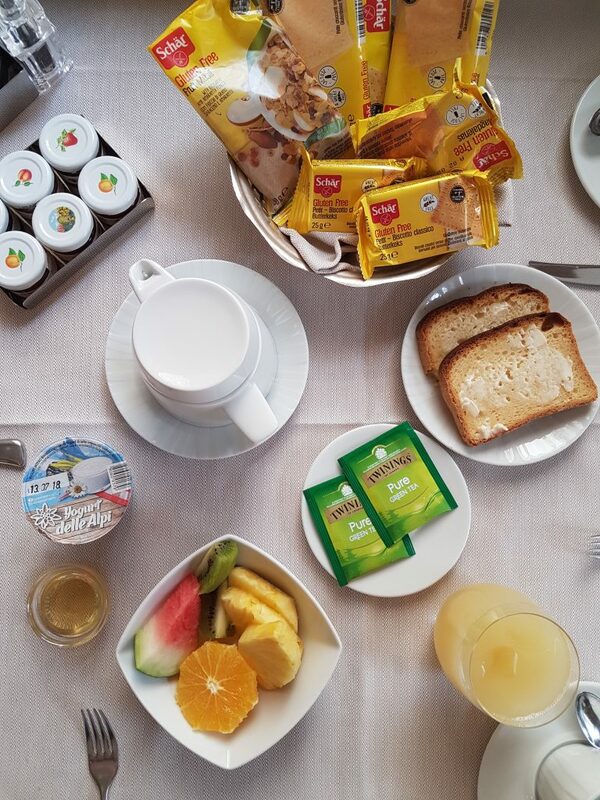 If you are lucky enough to be staying at Hotel Brunelleschi, make sure you are hungry when you head to breakfast. Each day there is a huuuuuge breakfast buffet with everything you could wish to find. 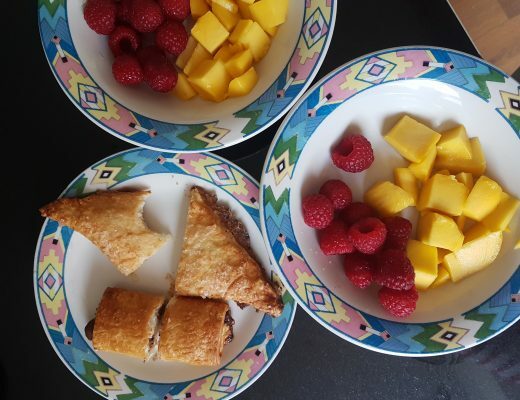 I was provided with a huge array of gluten free goodies to add to my breakfast, so if you are coeliac like me be sure to notify the hotel in advance for fresh baked gluten free bread and all the Schar goodies. There is also an a la carte breakfast menu to choose from. Oh and the breakfast room is beautiful too – the stained glass windows were incredible! As I mentioned before, we were kindly hosted by the hotel but I would definitely stay here as a paying guest in the future. 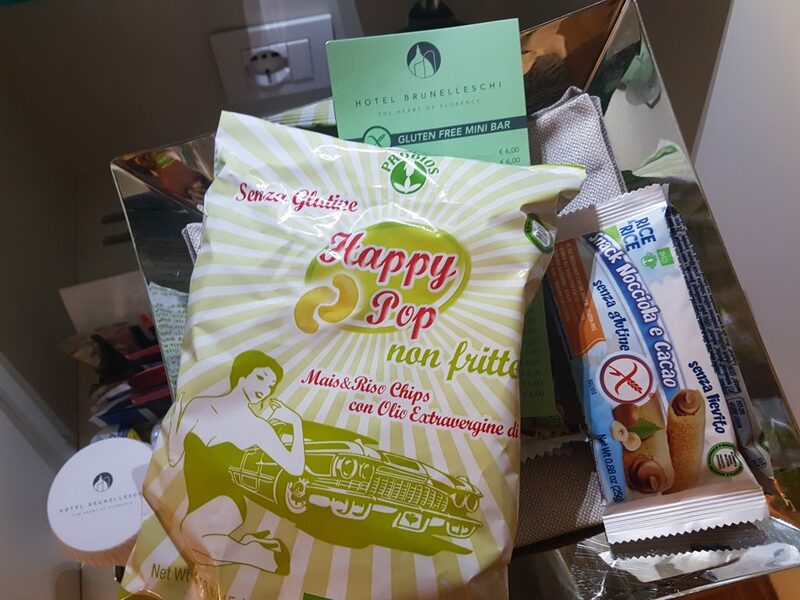 Not only was Hotel Brunelleschi incredibly coeliac-friendly (they even stocked our room with a gluten free mini bar! 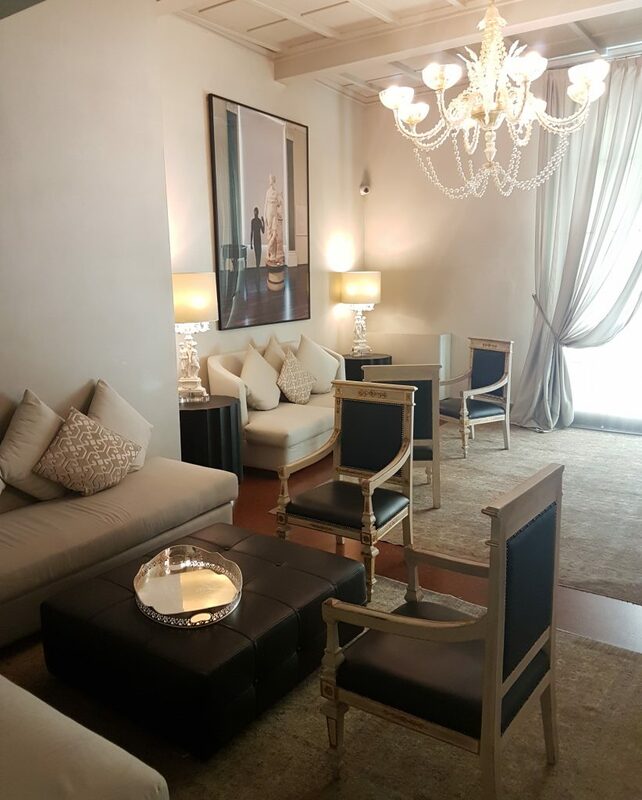 ), but the rooms were sheer luxury – a perfect blend of history and modern style with cool interior design features. 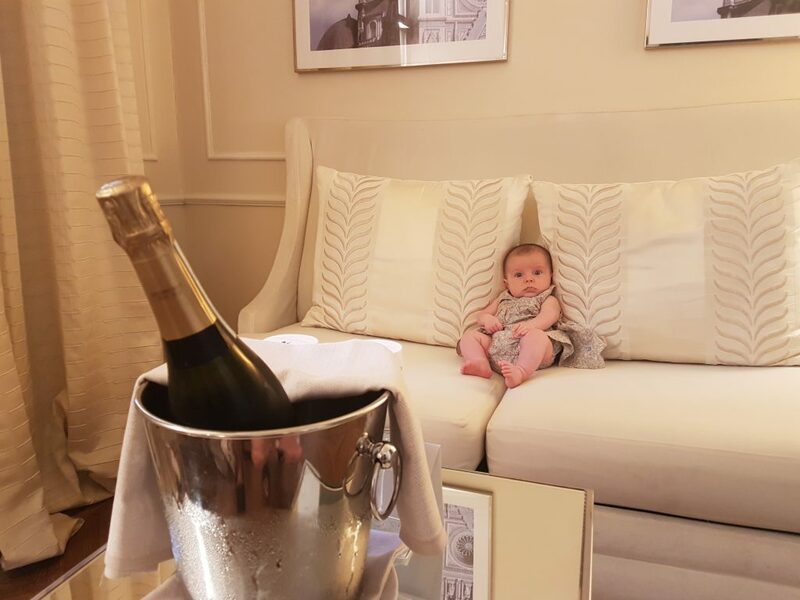 Our daughter Alba was very at home in our suite, she particularly enjoyed napping on the comfortable bed and having a luxurious jacuzzi bath at the end of a long day of travel :). If you want to splash the cash and treat yourself then top end suites come with monogrammed pillow cases, jacuzzi baths, proper coffee machines, tonnes of other luxuries and unrivalled views of the duomo itself. 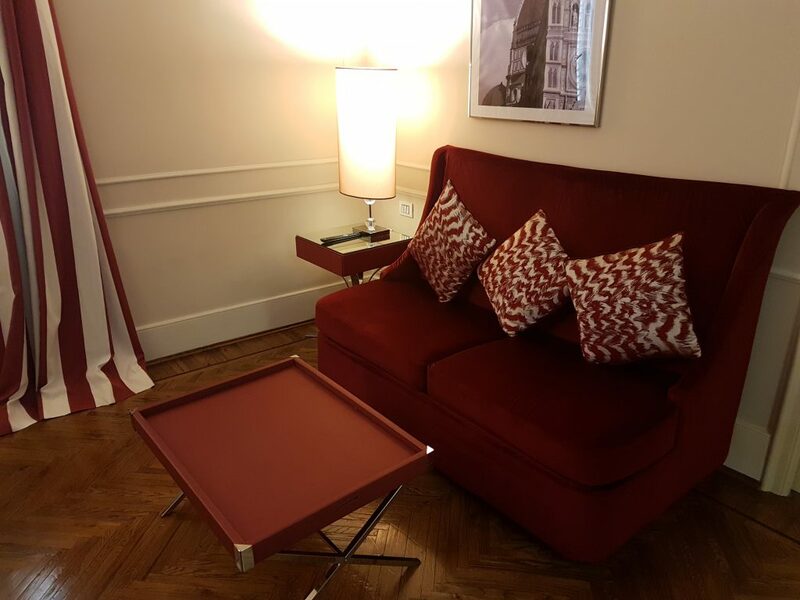 The level of opulence in some of the finest suites really was incredible.